Details will be released on GEPR and the Agora discussion platform at a later date. This article will cover the main points. Session 1 "Reconsidering Radiation Risks"
In the keynote speech of Session 1, "Mankind's Fear of Nuclear Technology is Mistaken", Prof. Allison expressed the following views. In the Great East Japan Earthquake, the tsunami was the focal point of the damage. In contrast, in the Fukushima Nuclear Disaster, while three nuclear reactors were damaged, there were no deaths. The panic in Japan and around the world surrounding the Fukushima Disaster was unnecessary. The excessive fear of radiation clouded the issue. The UN and politicians must establish regulations scientifically. Strengthening regulations leads to increased costs. It is also necessary that citizens understand the risks of radiation. It is unnecessary to pursue safety overzealously, such as setting a protective standard for radiation at "decontamination to an air dose of 1mSv" as the current Japanese government has done. At the current level of radiation in eastern Japan, there will be no negative effects on health as a result of the nuclear disaster in Japan. In response to this, Paul Blustein, an American journalist residing in Japan, spoke about his personal experiences. At the initial outbreak of the disaster, he was ill-informed about radiation and felt uneasy. However, while calmly gathering information, his thinking changed. The western media amplified the anxiety, and the American government distributed information to its own citizens that was slanted toward danger. He analyzed, "The American response is having a negative influence on Japanese society even now. Composure is a necessity in discussions regarding radiation." Assistant Professor Tetsuo Sawada of the Tokyo Institute of Technology is an advocate for the use of nuclear power who makes statement in the media and conducts public awareness campaigns. Following the nuclear disaster, he was branded an academic yes-man for the government. He expressed his impressions, "Since before the disaster, communication regarding this issue never made any progress. This gave rise to emotional antagonism between proponents and detractors after the disaster, and the issue is perpetually tinged with partisanship. There seems to be no way in sight of improving the discourse and making it more cool-headed." 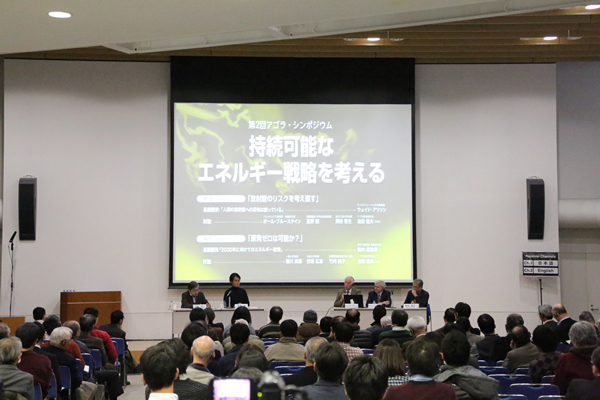 At this conference, in order to incorporate a layman's perspective, we invited Takeshi Natsuno, a guest professor at Keio University well-known as a business entrepreneur and neutral on the nuclear power issue. Mr. Natsuno gave the following analysis. "I feel the nuclear power plant issue is a vast social phenomenon that indicates how public opinion will diverge when a society has lost trust. Ordinarily, I would agree with what Prof. Allison says, but in the current situation of Japan, people will not accept it." In the ensuing discussion, the panelists spoke about methods of regaining trust. Prof. Allison emphasized, "The government as well as experts must be bold in explaining the scientific facts. Then regulations must be created by the UN and national governments, including Japan, based on the ICRP (International Commission on Radiological Protection). Dr. Ikeda also pointed out that partisanship is too intense on this issue, with emotions coming to the fore, and stated, "Cool-headed discussion is a prerequisite for an open dialogue." "Why not broadcast all commissions of inquiry regarding nuclear power on Nico Nico Live, and open everything up to the public?" This was a suggestion by Mr. Natsuno, who stated that were this not done, the "distrust" currently held by Japanese citizens "cannot be assuaged." Session 2 "Is Zero Nuclear Possible?" In the Session 2 keynote speech, " Energy and Nuclear Power Policy after 3/11", Japan Atomic Energy Commission Vice-chairman Tatsujiro Suzuki made the following assertions. In nuclear energy policy, a response to the Fukushima disaster is the highest priority, and funding and manpower must be focused on this. The largest issue relating to the effects of the disaster is "a loss of public trust." Efforts must be made toward transparency, impartiality, and participation by the public in decision-making. While a shift in policy on nuclear power is necessary, a transitional period is also necessary. Starting from a policy of promoting the use of fast-breeder reactors and a nuclear fuel cycle that processes and reuses spent fuel, it is necessary to establish flexible alternatives. Regarding the issue of the final disposal of spent fuel, it is necessary to increase participation by the government and seek out a solution. Takeo Kikkawa, a professor at Hitotsubashi University who participates in government policy making as a member of the Fundamental Issues Subcommittee of the Advisory Committee for Natural Resources and Energy etc., praised Dr. Suzuki's assertions. Regarding recent energy policy, he indicated that "the lack of reality is a problem." Former Democratic Party policies such as advocating zero nuclear and the notion of returning to pre-3/11 policy held by some in the Liberal Democratic Party and METI are "both problematic." Ms. Takeuchi indicated that there is a need to consider "whether zero nuclear in the near future is possible." She said, "In energy, it is necessary to consider the 'Three E's' of economics, ecology, and energy security. The discussion on global warming countermeasures must also be promoted in coordination with other policies." Hiroshi Tasaka, representative of the SophiaBank think tank, is known for his social commentary and entrepreneurial activities, but he is an expert who has studied the final disposal of radioactive waste for 20 years. He also advised the Kan administration on the response to the Fukushima disaster as a special advisor to the Cabinet. He said that expansion of nuclear power must be prudent. "While geological disposal is possible from a technological standpoint, we cannot find a place to do it. We cannot secure public acceptance. We must confront this reality," he stated. Furthermore, the concept on NIMBY (Not In My Back Yard: I understand the necessity, but don't build it in my back yard) exists in every country, including Japan. "If we had continued to conduct nuclear power generation safely in Japan and built trust, we may have been able to make progress in the discussion on final disposal. However, in the wake of the Fukushima disaster, it has been judged to be nearly impossible," he indicated. He further warned, "The irresponsibility that allows problems to progress without any serious self-review is resulting in the distrust of the public." The participants were unanimous that abruptly eliminating all nuclear power generation would be highly difficult. They also predicted that with the legislation of the 40 year reactor decommissioning rule, the proportion of energy produced by nuclear power would decline over the long term. However, opinion was divided. "In the current situation, discussion of nuclear power generation becomes emotional. No matter which direction you take, you will run into a some kind of populism. A long time will be necessary for the public to learn on their own," stated Dr. Tasaka. In contrast, Nobuo Ikeda, chairman of the discussion and director of Agora Institute, indicated, "We must resolve the problem that the discussion over the future of nuclear power urgently needs a solution. In the current situation the cessation of nuclear power generation in Japan is incurring excess fuel costs of ¥10 billion per day." Conclusion -- The Long Road to "Restoring Trust"
A recurring point at the conference was the "loss of trust" regarding energy policy. In addition to the disaster itself, this was caused by the impression held by many that they were "uninformed" or "deceived" by the energy and nuclear power administration until now. The fear and the intentions of some political groups to use anti-nuclear sentiment for political power combined with this to create the current situation in which distrust and confusion are unabated. In this discussion, there are some who will not face the facts. In Session 1, the question "Do you think the nuclear accident in Japan will cause negative health effects?' was asked in a Nico Nico Live poll. Of the two options "Yes" or "No", 49% answered the former. Though the risk of negative health effects is small, many people believe incorrect information. This is a serious problem. However, this too is in the context of the belief that "one cannot trust the statements of the government or experts." This is also a problem for the public as individuals as well. "One idea is that in addition to an obligation for each prefecture to store spent nuclear fuel in proportion to its population, I think it would be good if there was a way to consider responsibility for the public. Obviously, most people were unable to participate in the decisions to introduce and use nuclear power. However, going forward, perhaps this may be an impetus for people to involve themselves in decision making as a personal issue," suggested Dr. Tasaka. 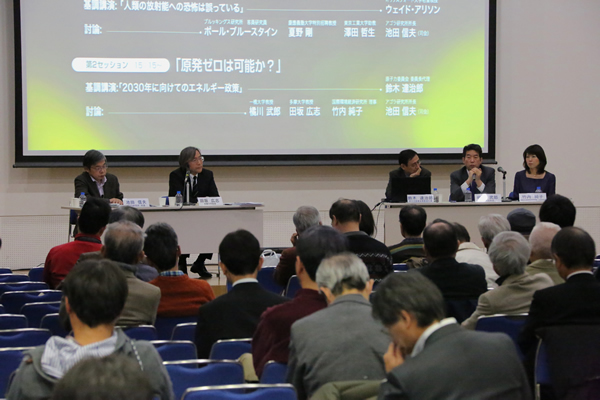 Regarding the continuation and importance of the use of nuclear power, the majority of participants offered an affirmative view. A sustainable energy strategy lies in the use of balanced and diverse energy sources while paying attention to costs. Among them, at the current point in time, nuclear power is still a meaningful option. However, no matter how much its advantages are emphasized, as long as it does not have public acceptance, Japan will be unable to use nuclear power. Of course, illogical or emotional arguments are prominent in opposing arguments. However, it is necessary to look at the legitimate questions among them and build a public consensus. That the path to recovering trust and building a public consensus regarding energy policy is a long one and the problems difficult was something that once again was brought into sharp relief at the conference. However, regardless of one's position, we must treat energy choices as a personal issue, and continue to think about the appropriate stance to take.